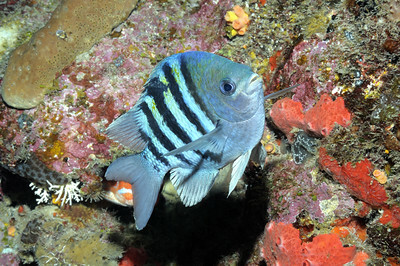 The sergeant major (Abudefduf saxatilis) is a species of damselfish. A distinctive feature are the five black body bars. The upper body is uasullay yellow and white to light gray below. The males become dark blue to purple during courtship and when guarding egg patches. The males defend the egg patches aggressively towards intruders. Sergeant majors grows to a maximum length of about 4-6 in., max 7 in. They can be found in depths of 1-40 ft. They feed upon the larvae of invertebrates, zooplankton, smaller fish, crustaceans, and various species of algae.